Finished waist: 25 (28 1/4, 30, 33 1/4, 35)"
Pattern calls for 6 (8, 8, 9, 10) balls of Wisdom Yarns Poems in MC, and 1 ball of Universal Worsted in CC. 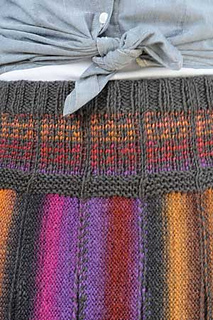 “The pleated section is worked side-to-side, then stitches are joined using Kitchener stitch. Stitches are picked up and decreased to from the colorwork yoke, then a ribbed casing is worked for an elastic waistband.” Interweave Knits, Weekend 2011, page 50.